, was founded in year 2000 by Mr.Jagmohan Singh with its corporate office in Mumbai. Within 2 decades of existence, it has earned many of the Corporate Clients & has grown exponentially to become a name to reckon with in the Signage Industry. Budget Signs is one of the Best Sign Companies in India, providing Indoor and Outdoor signs, Digital signs, Modular Furniture to major National & International Corporate Clients. Budget Group effectively handles an entire Corporate Identity Rollout Programme right from Conceptual & Structural Designing to appropriate Material Recommendation, Production, Installation & After Sales Services. 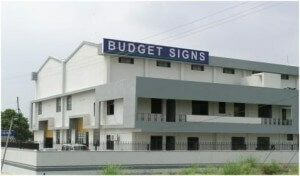 In the year 2003, Budget Signs added 70,000 sq.ft manufacturing facility in the Special Economic Zone at Baddi, Himachal Pradesh in Northern India & in 2012 started one more Manufacturing Unit with name of JMS Universal Technologies Pvt Ltd located in town of Silvasa on the border of Mumbai & Gujarat in Western India. JMS is spread into area of 80,000 sq.ft & is equipped with all the latest machinery required for production” & has more than 300 employees working.